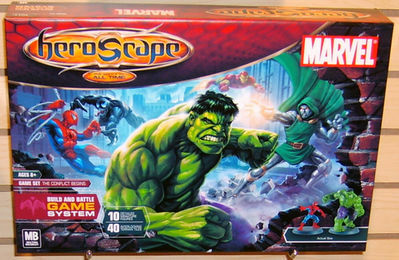 Marvel Legends Heroscape: House Mouse has Marvel available for pre-order with a scheduled release date of July. Funagain has it scheduled to be available in June. This one should be easy for any marketing exec: May. May is all about Spider-Man. Who the heck wouldn't want to see that movie and then go out and buy a battle game that features two characters seen in this movie (Spidey and Venom) along with a host of Marvel's greatest heroes and villains (including the now deceased Captain America)? If we don't see this in May or early June at the latest, shame on Hasbro for missing a golden moment for marketing. I still say this game was delayed (from January) for this very purpose. My bet is on May. Wave 7: Game Trade Magazine #86 (that link is a .pdf, the product is on page 6) solicits it to ship in May (this is published by Alliance Game Distributors). Funagain Games has it listed for a June release. House Mouse Games also has it listed for a June release, but House Mouse's owner Sandra has recently been on this thread to state that it won't be available until July. I'm betting on extremely late June to July. Swarm of the Marro: Funagain and House Mouse both have it available for pre-order with an expected release date of June. I'm just not buying it. I predict this one will see it's premier at GenCon. Large Expansion Wave 3: Wow! Funagain is on fire. They got the drop on House Mouse on no less than 3 releases. Too bad they have a spotty reputation for delivering when they promise. They say June, I say August (probably GenCon again). Wave 8: Funagain Games is the only resource currently pre-soliciting this and they are giving it a July release. I would be astounded for this to come out within a month of Wave 7. I'm thinking more like September. We may see it at GenCon, but I doubt it. Wave 9: Funagain Games is at it again. Once again, the only ones to make this available for pre-order at this time. They have it listed as releasing in September. The way things are going, I'd be hopeful for November (Christmas shopping time), but I'd be pleasantly surprised to see it in 2007 at all. There you have it. 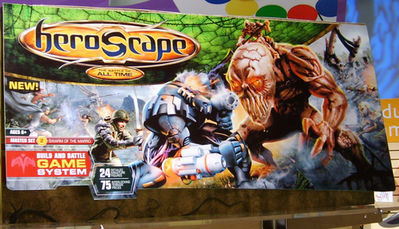 It's looking like our HeroScape drought will more than likely last awhile longer, followed by a possible flood of Valhallan goodness.